Intel quietly released the new server processor Xeon E3-1290 today, with a dynamic acceleration frequency of 4GHz. This is the first time the Sandy Bridge family has reached this level. The Xeon E3-1290 is a quad-core processor for the single server and workstation market. It supports Hyper-Threading with an original clock speed of 3.6 GHz. It also supports Turbo Boost 2.0 dynamic acceleration technology and can be accelerated to 4.0 GHz in single-core applications. 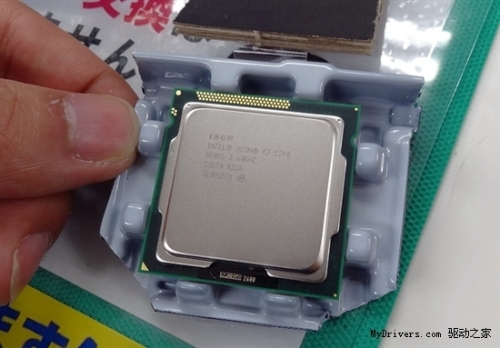 It is a disguised realization of the dream of the Pentium 4 was not round, but also created a new record for the speed of the Sandy Bridge family. In contrast, the fastest Core i7-2600/K in the desktop model is only 3.4/3.8GHz, and there is no sign of acceleration in the short term. Xeon E3-1290 also has 8MB L3 cache, supports vPro and ASE, AVX and other instruction sets, supports dual-channel DDR3-1333 memory and ECC error check, no integrated graphics core, LGA1155 package interface, thermal design power consumption of 95W. The official wholesale price of the Xeon E3-1290 is $885, which is 45% more than the previous Xeon E3-1280. At present, the actual retail price in the Akihabara market in Japan is 81800-82800 yen, which is approximately RMB 6550-6630. According to the roadmap, there is no faster Xeon E3-1200 series model at least this year.